1. Do I need an official sailing certificate to charter with Siam Sailing? 2. What days of the week do Siam Sailing's charters start and finish? 3. I'm game and want to book, how do I proceed? 4. How and where do I obtain provisions for my bareboat charter? 5. What is included in the charter price? 6. What is not included in the charter price? 7. What extra costs can I expect to have during my charter and how much? 8. What weather conditions can I expect during my charter? 9. I'm a keen scuba diver. Can I take diving equipment on my charter? 10. Are inoculations for tropical diseases required or advisable when sailing in the Andaman Sea? 11. Am I likely to encounter any dangerous animals? 12. Is piracy an issue in Thailand? 13. Am I expected to tip the crew on skippered or crewed charter? 14. Crewed charter: I'm a vegetarian/vegan. Is this a problem? 15. Skippered charter/crewed charter : does your crew speak English? 16. Are there mooring charges in the sailing area, if so how much? Q1. Do I need an official sailing certificate to charter with Siam Sailing? We do not require an official sailing certificate of you in order to charter one of our yachts. In the booking form 's Skipper's Questionnaire you will be asked about your sailing experience and any certificates you may have. Q2. 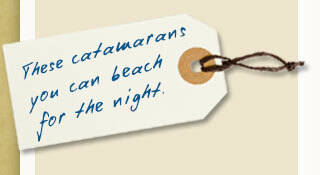 What days of the week do Siam Sailing's charters start and finish? Charters can start or finish any day of the week. Charters normally start and finish at 09.00. Q3. I'm game and want to book, how do I proceed? Q4. How and where do I obtain provisions for my bareboat charter? 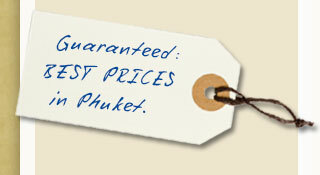 Phuket island has ample opportunities to do your shopping for provisions. If you take advantage of our optional transfer service then on the way to our base a stop can be made, usually at the Tesco Lotus hypermarket, to obtain what you need. 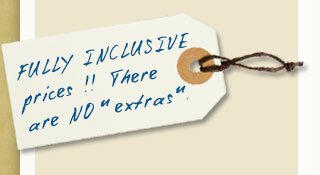 Alternatively you can take advantage of our provisioning service. In this case you send us a list of the provisions you'd like us to buy on your behalf. Upon your arrival on board you will find these already stored on the boat. Costs of the provisioning service is 500 baht + 10 % of the shopping bill. Payment, in cash please, upon boarding. Possibilities for shopping in the direct vicinity of Ao Yon, our base are limited. Q5. What is included in the charter price? - cell phone incl. user fees etc. Crewed charter: all of the above + cook's services as well as 3 warm meals per day, coffee, tea, soft drinks, snacks etc. Q6. What is not included in the charter price? Bareboat charter: food & drink, any fuel beyond the one tank supplied. Note: Some area's are designated National Park. If you choose to go to these area's you may (or may not) be asked to pay the relevant fee, which typically is 200 baht. 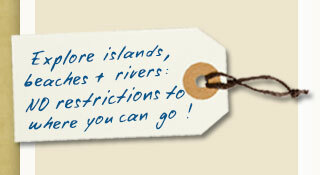 Park fees are not levied by us and therefore not included in the charter price. Q7. What extra costs can I expect to have during my charter and how much? Dining out: for 150-400 baht one can eat very well in most places. National Park fees, where applicable, typically 200 baht per person per night. Q8. What weather conditions can I expect during my charter? Thailand has a monsoon climate. Contrary to what many people think a monsoon is not a strong tropical wind with lots of rain (that's a typhoon) but simply a prevailing wind which blows six months out of the year from one direction and the other six months from the opposite. On the Andaman coast the prevailing wind in the months from about half November until half of May comes from the North East. In the early weeks of the NE monsoon the average wind speed is some 10-15 kts and a rain shower every few days is not unusual. Towards Christmas the winds abate a bit, averaging 8-12 kts. Rain after Christmas is (very) rare. Later on in the season we often see that there is a useful 10-12 kts NE wind in the morning which dies away after lunch and shifts to the SW, increasing to 8-10 kts again. This pattern can be very useful for those of us who dislike sailing to windward ... Towards the end of May just prior to the shifting of the monsoons the wind is often, but certainly not always, fickle. The Southern Andaman coast is mercifully free of tropical storms. Average temperatures during the NE season is about 29 degr C . Visibility in the mornings and and late afternoons good, sometimes a bit hazy during the middle of the day and early afternoons. Fog is extremely rare. Usually towards mid May the prevailing wind will shift to the SW or W. In open sea some considerable swell may build up which takes an experienced crew to cope with it. Inshore there are still plenty opportunities for easy and sheltered sailing though. In June, July and August wind strengths on average are some 12-16 kts. Though nicknamed "wet monsoon" or "low season" the weather during June, July and August is mostly actually very nice . During this time you will possibly experience a few rain showers but usually not much more then that. Temperatures still average about 28 degr C. Visibility is nearly always very good. Fog is extremely rare. Sept. and Oct. are usually the wettest months of the year but even during these months prolonged periods of rain are rare. What rain falls tends to come in squalls, seldom lasting more then 30 minutes or so. To keep you abreast of the weather we send you each morning at 06.00 a 3 day forecast by SMS text message to the boat's cell phone. Q9. I'm a keen scuba diver. Can I take diving equipment on my charter? We do not allow scuba diving from our yachts. Snorkelling is ok of course. If you'd like to dive the most rewarding way is to book a ½ day or full day diving with one of the dive centres you will find en route. Just about all of them are very professional, safe, use top quality gear and, of course know the dive sites very well. Dive centres you will find galore along Phuket's west coast, the Similan Islands, Ray Leh beach, Phi Phi, Koh Lanta, Koh Racha and Koh Lipe in the Butangs. Q10. Are inoculations for tropical diseases required or advisable when sailing in the Andaman Sea? If your stay in Thailand is restricted to the coast no inoculations are necessary or advisable. South Thailand is malaria free. Should you in addition to your sailing charter also plan to trek up in Northern Thailand and the border area's with Burma, some inoculations and/or anti–malaria medications may be advisable. For this, please consult your doctor. Q11. Am I likely to encounter any dangerous animals? No, the most dangerous animal you are likely to encounter is the humble sea urchin. If you step on them their spines will pierce the skin of your foot. Although this is somewhat painful, sea urchin spines are not venomous. You can avoid any trouble with sea urchins by not walking on coral, which you shouldn't do in the first place. From time to time you will see the odd jelly fish but whilst they, if you are unlucky, might give you an itchy rash if you get swiped by them, they are basically harmless. Man-eating sharks, sea crocodiles as well as fiery dragons have since many centuries disappeared from Thai waters. You can eat all fish you catch, none will eat you. There is no ciquatera. Also on land there is no animal to worry about. Even the stray dogs, which you sometimes see on Phuket's west coast, are friendly. Q12. Is piracy an issue in Thailand? Yes, piracy is a huge issue in Thailand. Handbags, CD's, watches, designer sunglasses , expensive branded clothes, nothing is safe from piracy and all these goods can be purchased for peanuts at shops and market stalls. Long may it stay that way! The pirates of the type that robs boats and ships have disappeared a long time ago though. They now probably sell the fake handbags, CD's, watches, designer sunglasses, etc. Q13. Am I expected to tip the crew on skippered or crewed charter? 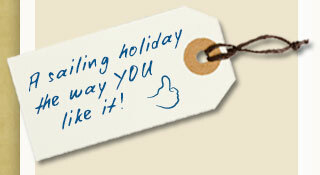 The crew does not expect but will hugely appreciate a tip after you have had a pleasant holiday. Q14. Crewed charter: I'm a vegetarian/vegan. Is this a problem? Dietary requirements or preferences are no problem at all. Please do let us know well in advance of your trip though, so we can keep this in mind when planning the menu's. Q15. Skippered charter/crewed charter : does your crew speak English? All of our crews speak (very good) English. Q16. Are there mooring charges in the sailing area, if so how much? Throughout he sailing area you will find mooring buoys. Their use is absolutely free. In National Park area's you may (or may not) be approached by a uniformed park ranger and asked to pay the national park fee but that has nothing to do with you using a mooring. Had you arrived by an organised tour you would have been asked to pay the same fee.